22", 42" x 36" Detroit Dry Dock Co. engine, 1895; 600 hp, 85 rpm. 12'3" x 11'6", 155# Scotch boiler; Dry Dock Engine Works, 1895. 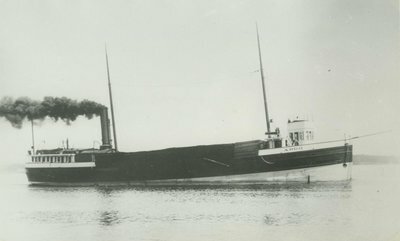 1895, May 4 First inspected; towed 2-3 big barges in lumber trade. 1903 Owned Argo Steamship Co, Cleveland, OH. 1911 Reboilered-scotch boiler 12 x 14'. 1930 Renamed GLEN; owned Nessen Transportation Co., Manistee, MI. 1932 Laid up Manistee, MI.